"The owner is super helpful and the location is unbeatable." Have a question for Little Star Guesthouse? "The breakfast room was nice." "Good breakfast from local ingredients." "Nice staff and convenient location"
"The room felt good, and clean." Situated in Hongdae, Hi Jun Guesthouse is the perfect place to experience Seoul and its surroundings. The excitement of the city center is only 6km away. With its convenient location, the hotel offers easy access to the city's must-see destinations. Hi Jun Guesthouse also offers many facilities to enrich your stay in Seoul. A selection of top-class facilities such as free Wi-Fi in all rooms, express check-in/check-out, luggage storage, Wi-Fi in public areas, family room can be enjoyed at the hotel. Step into one of 13 inviting rooms and escape the stresses of the day with a wide range of amenities such as clothes rack, complimentary instant coffee, complimentary tea, linens, mirror which can be found in some rooms. Besides, the hotel's host of recreational offerings ensures you have plenty to do during your stay. With an ideal location and facilities to match, Hi Jun Guesthouse hits the spot in many ways. "This hostel is near attractive places and local restaurants..."
The host was very nice and helpful and the room was very clean and comfortable. It just took like 10 minutes to the subway which was quite convenient. It was a really good experience and I would definitely stay here again when I visit Korea next time. Thank you for staying and your review. I was so happy to meet you :) Hope to see you again!! I wish you all the best~~~!! simply amazing! feels like home! The most i love is their guesthouse's cleanliness, comfortable , nice & friendly staff minsu and owner Jun! will definitely come back here for sure! highly recommended and you wont regret about it!! We would stay forever if we could! Jun is so friendly and helpful :) I enjoyed chatting with him in the mornings! My friend and I stayed on the 2nd floor with a private washroom. The room was very clean and stylish. There are slippers, towels, shampoo, and body wash prepared for you! The common area is also very stylish and always stocked with food for breakfast! Jun helped us arrange for a taxi to Incheon airport and his employees are also very friendly in helping us move out. I cannot believe we were able to stay at such a cozy and happy place for such a good price! Finding the place was a trick as it sits back in a small road. I was put in a small room with bunk beds even though I asked for a full bed. I'm 6'1'' so I was short on bed space. Room was clean as was the toilet/shower. Noisy especially at around 2.a.m . Site said it was two KMs from Severance Hospital which was not correct. I had to take a taxi to the hospital for my appointment. clean, friendly and responsible staff, great facilities however not for sensitive hearing people as no sound proof wall. Would suggest guesthouse to make rules like after 11pm no staying on common area and reduce volume/voice. The location was great but if you travel with child you should consider another location, this area surrounded by club ,wine house and music house so at night it was a lot of people smoking at the street. But if you like the night activities this hostel would be great... The breakfast room was nice. But my room was quite cold at night. The guesthouse was a really good place to stay at if you're traveling with your friends. The only thing that I didn't like was that it had no elevator so it was all stairs (which is my issue since i'm not physically fit and still has a big luggage). Other than that, the staff were friendly and they were very responsive via Facebook. Location was superb, breakfast was decent and other amenities were good. They even lent us adaptors for our phone charges. I would definitely go back with less luggage, or not. I go travel with my friends , 2 girls . Stay here for 9 night ! Jun and sea very take care of us very well , Always help us everything. The room very cozy and value for money . However it not far from Hongik station . We will go again for sure ! Thank Jun And Sua . Love Korea !! The location is great and walkable to several stations. Jun was very communicative from the moment of booking and accommodating. There was an initial mixup regarding our room but he more than made up for it by providing an alternative and prorating the cost. Additionally, he was very flexible regarding check out! You should be advised though that there are about 3 flights of stairs to the main area and then another flight to the rooms if accessibility/luggage is a concern. But Jun was very helpful with our bags. Awesome stay! Location, awesome staff, washer is free to use. Hi Jun Guesthouse is by far the best hostel/guesthouse in Asia. The staff are really friendly, great to talk to, and informative. They send you picture directions which make it simple to get to the guesthouse. It is near a popular party district but far enough where you wouldn't be disturbed at night. The price for this place is cheap for what you get. Free breakfast and washer with soap, towel, shampoo, body soap and conditioner, private rooms with 2 twin beds (not sure what other rooms they had), and great location. I'll definitely stay here again when I go to Korea. The room was very comfortable for the two of us. Plenty of restaurants nearby. Staffs were very helpful. We stayed here for 6D5N and I have to say we were happy that we booked here. The staffs were very attentive especially the boss, Jun. he really tried to cater to all our needs and even allow us for late checkout since there was no traveller checking in that day. Thanks so much Jun for the hospitality!! Would definitely stay here if I visit Seoul again. Value for money and the guesthouse provides all the basic amenities that is required for travel between friends. Owner was friendly and took time to make small talk to ensure that we would be comfortable in his house. 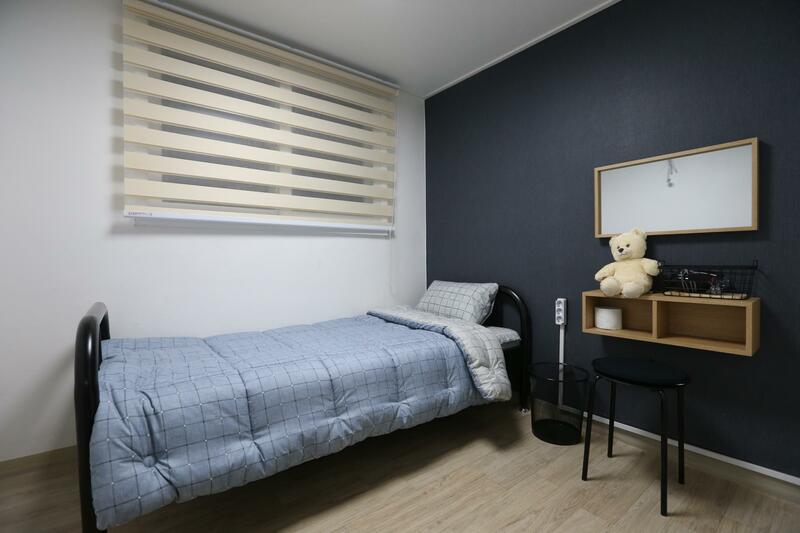 The location is a distance from the popular area in Hongdae (different subway exits) but that also meant a quiet location away from the crowd so that guest can rest in comfort at night. Would recommend this guesthouse for solo travellers or with friends. Took around 10 mins to reach hotel with luggage. They only provide small tower, toilet is small and the design of the shower will leads to water leak at toilet door. Has coin washing machine and dryer, but the period to use is not convenient. Various of breakfast, kindly staffs, good at English for communication, prompt reply for customer"s request.Comfortable room!Nice choice for seoul trip. 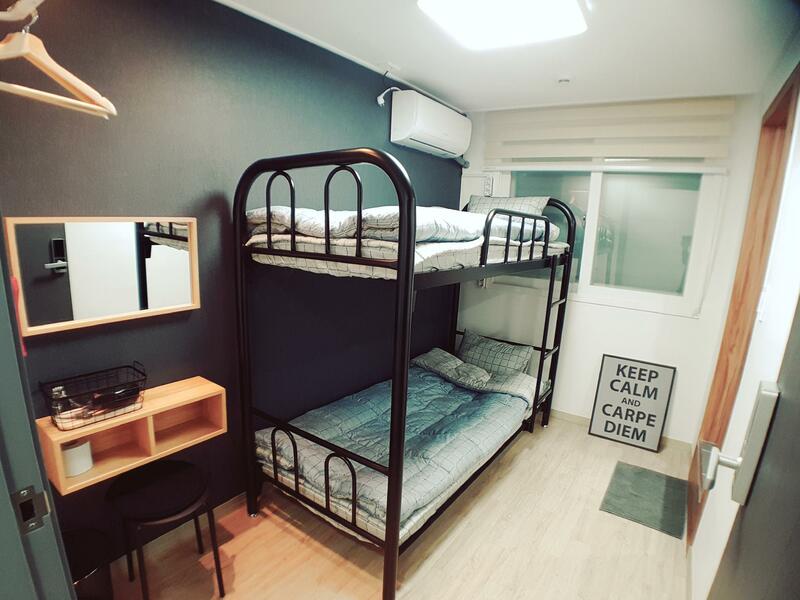 This hostel is near attractive places and local restaurants in Hongdae area. I stayed 4 nights at 1st floor for 3 ppl. Good breakfast from local ingredients. The room felt good, and clean. The shared kitchen has all basic things you'll need. It's about 10-15 mins walk to the crowd of Hongdae/ subway station but I found that fine.